When you think about adventures, many images can be conjured up. From Indiana Jones running from a boulder, quiet time fishing on a secluded beach and all things in between might come to mind. Now, I certainly don’t see myself as a rugged caution to the wind kind of traveler. However, over the past few years life has created situations in which personal growth have gone hand in hand with experiences via travel. It is not that much of a stretch to say that I have become a bit more daring in the selection of places that I choose to visit. Without a doubt, I am now much less intimidated by the number of miles I am willing to travel from home. This summer my ongoing self-exploration took me to the winter weather of the southern hemisphere. More specifically, I briefly visited Australia and spent several weeks trekking through New Zealand. My choice of destinations was primarily based on a very affordable airline ticket. I had heard that it was a beautiful country, but up until the fare watcher rate emerged, New Zealand was not on my short list of overseas destinations. 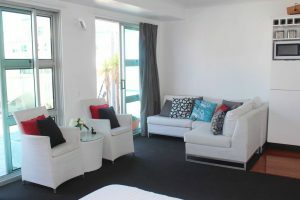 With the ticket purchased, I began to do a little cursory research on places to stay in Auckland (My home base for the trip). Most hotels were roughly $150-300 a night, which made a 14 to 20 day stay a bit cost prohibitive. This led me to investigate AirBnB options, which quickly became overwhelming. Within a few days, I was already burnt out planning this trip. At this point, I stopped looking for lodging and started focusing on a short list of things that I would like to do while on the island. A theme of adventures involving ferry travel quickly emerged. This provided me with a new focus regarding lodging. Re-invigorated, I hopped back on AirBnB and found 2 places that were near the ferry port. Both spots were well under 100 New Zealand dollars a night. I ended up choosing the one that had slightly better reviews. Comfortable with my choice, I moved on to other details. Next up on my trip planning checklist, was to select a few guided tours throughout my stay. Having learned a lot about myself over the last few years, I knew that I didn’t want to be tied down to a tour everyday, but I also needed a few things on the schedule to prevent aimlessness in my overall vacation. I strategically placed tours every couple of days to help maximize my number experiences, without overloading me or stressing me out. I mixed and matched both half day and full day excursions, which really fit the bill. With all my planning done, I was ready to traverse nearly 10,000 miles to visit the land of Kiwis. The flight was operated by Quantas, and they did their best to make us as comfortable as possible. The flight attendants fed us every 2 hours and kept the drinks flowing. I was able to sleep for a solid 8 hours, but was horrified when I awoke to realize we still had another 8 hours of flight time to go. Even with the wonderful service, 22 hours on a plane was brutal. 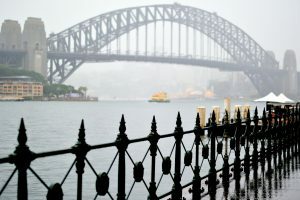 Direct flights to New Zealand were not available from DFW, but I was somewhat excited about my layover in Sydney. I had roughly 11 hours at my disposal to explore. After being on that plane for what seemed like an eternity, I was eager to stretch my legs and get some fresh air. I stowed my carry on in one of the automated lockers, picked up a few Austrailian dollars and headed for the train station. The train system was pretty easy to navigate and departed and returned to the airport terminal. It was a quick 25 minute trip to Hyde Park and the Quay Circle. 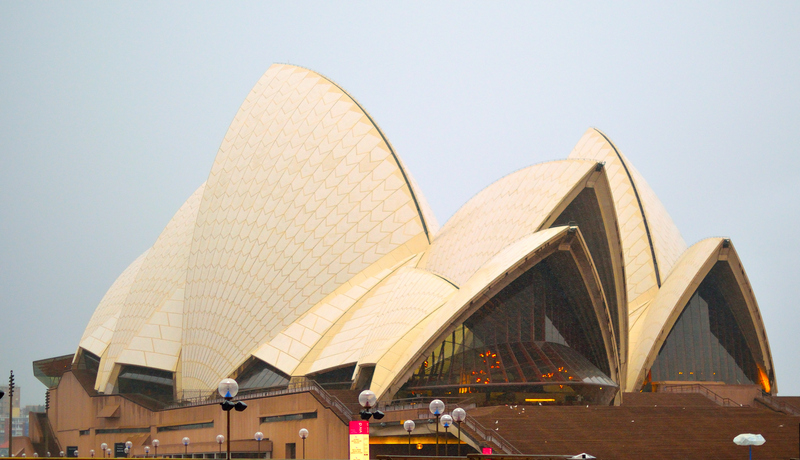 Once there, I focused my sightseeing on the major touristy areas which included the wharfs and Opera House. 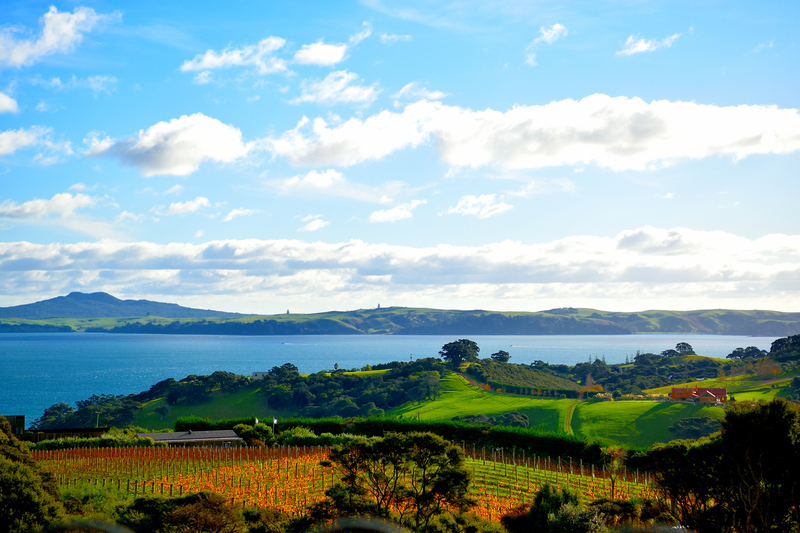 My first foray into the culture of New Zealand, was a wine tour to the outer island of Waiheke. 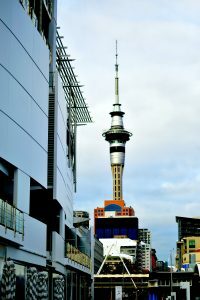 This four hour tour was perfect for my first day in Auckland. I was still pretty punchy from the flight, but having this booked forced me to acclimate to the New Zealand time differential. 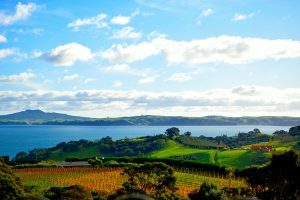 It was a short 40 minute ferry ride from the Aukland Viaduct and Hauraki Gulf to the Island. Once there, we were greeted by the tour operator and whisked away to the first of several stops. Stonyridge, Wild on Waiheke and Mudbrick were all amazing properties, but Mudbrick was by far the most beautiful winery I have ever encountered. The sweeping tiered vistas of vines were truly breathtaking. At the top of the hill, the tour guide portioned out some of their luscious wines, which was a perfect treat after the significant elevation we traversed. Not only did we explore several vineyards and a brewery, but this tour also included one of the island’s premiere olive farms. Rangihoua Estate has been harvesting high quality olives since 1997. They have well over 4200 trees and produce some outstanding extra virgin oils. The flavor profiles range from peppery and fruity to exceptionally herbal. Being of Italian heritage, olive oil is integrated into my DNA. However, I’ve never been educated on the methodology related to production of this nector. I also had no idea how unappetizing raw olive were to the palate. The staff at the orchard were very knowledgeable, and they provided a short but interesting tour. Of course the tour concluded in the gift shop, with a tasting of several of their award winning oils. I was truly impressed by the variety and intensity of flavors inherent in the oils. Overall, It was an educational and enjoyable tour, and I would definitely recommend it to anyone who is planning a New Zealand trip. My second day in the southern hemisphere was power packed with a full day tour of the southend of the North Island. 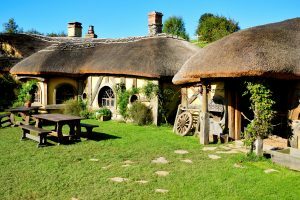 You can’t go all the way to New Zealand without including a visit to Hobbiton and the Waitomo Glowworm Caves. It is important to note that the majority of your day is going to be consumed by a 6 hour round trip coach ride to Matamata. Although this might sound like a downside to the tour, it absolutely was not. Tour operators will often throw around words like “scenic drive” and Bucolic Beauty” to downplay a long ride. However, in this case they would be on target with those descriptors. I was amazed at the pristine nature of the southern bush. Every 20 or 30 minutes the bus driver would provide little snippets of information related to the rustic towns, wildlife and bush. Generally, I’m easily annoyed by ongoing dialogue by tour operators, but that was not the case during this trip. I was truly interested in the broad range of information that she provided. When we arrived in Matamata, the weather was beautiful. This is significant, considering that New Zealand was in the beginning of their winter months and the rainy season. The temperature was right around 66 and there were about a dozen or so puffy clouds providing adequate shade during the tour. As we crested the hill into the Lord of the Rings and Hobbit set, I truly felt transported into another world. 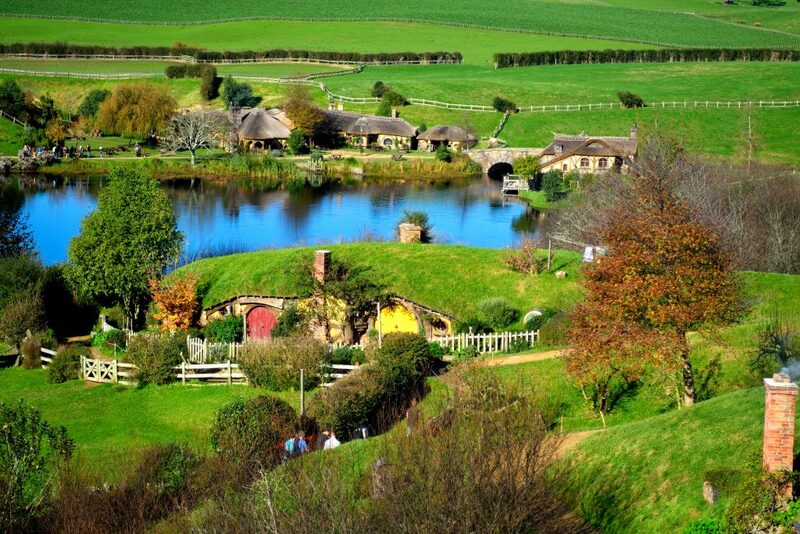 Sitting at the bottom of this multi -acre sheep farm, was Hobbiton. It was absolutely incredible! All of the hobbit holes were represented and in scale to real life. The tour operator provided a lot of information on the set’s construction and maintenance, but honestly I was barely listening. I was way to absorbed in the moment and tried to photographically document every inch of this magical place. 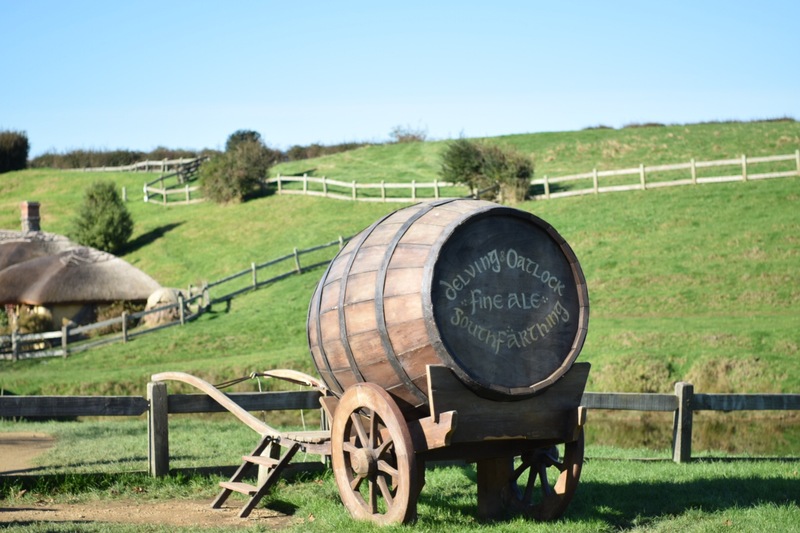 The tour ended at the Green Dragon which was also an integral part of both movie trilogies. The operators had hobbit beer waiting for us as well as a lunch buffet, that was one of the better meals I had during this trip. 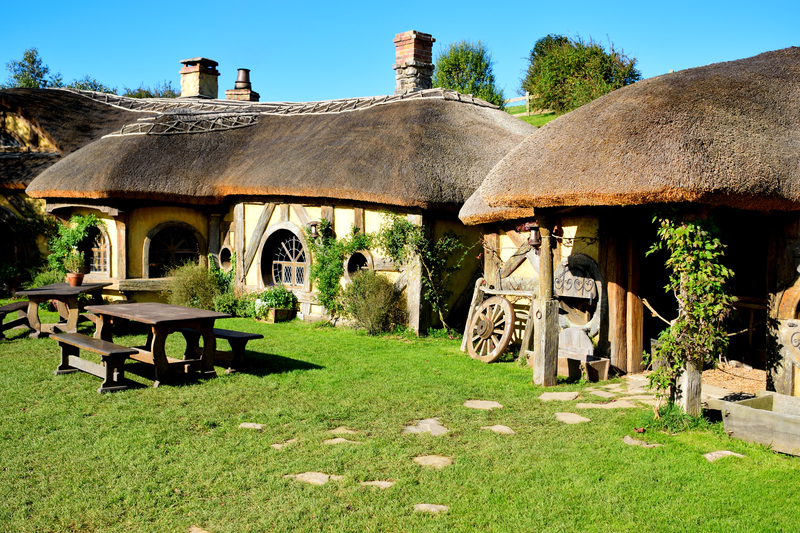 From Hobbiton, we traveled a few miles down the road to Waitomo Glowworm Caves. The enormous system of caves were first explored by one of the Maori chiefs and continues to provide revenue for the tribe. Primarily comprised of limestone, the caves provide a suitable habitat for an extremely divergent life form called the Arachnocampa luminosa or glow worm. These thread like worms hang precariously from the ceiling and emit a small spec of light, which is used to attract prey. Because of the intense darkness of the caves, the light of the glow worms mirror the image of an otherworldly starry sky. It was yet another breathtaking experience. I have to compliment the tour operators on the setup of the cave tour. It starts off in a well lit section of the caves and progressively devolves into darker and darker regions. Once you get to the final section, you find yourself in a pitch black area, which accentuates the effect of the thousands of glow worms hanging from the ceiling. To maximize the impact of this experience, the guides had informed all participants that absolute silence was required. It was truly a humbling moment. As I mentioned earlier, I didn’t want to over plan every day of my trip. On the next few days, I focused my efforts on getting to know the the city of Auckland. I have found in my previous travels, that I really enjoy getting lost in a city. Occasionally, this travel technique has led to the discovery of various hole in the wall places that would turn out to be highlights of my trips. This trip presented somewhat of a challenge to find those diamonds in the rough, but the ones I found were certainly worth the walk. 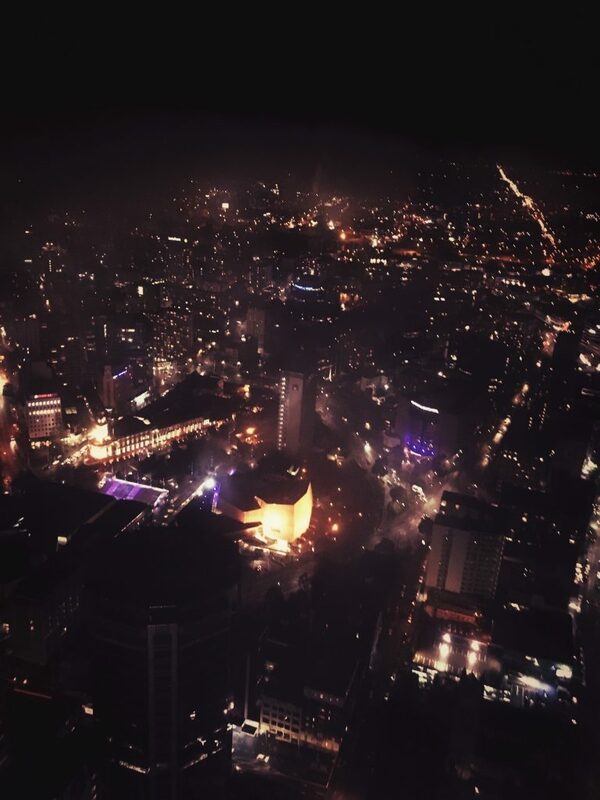 First up, the city of Auckland is roughly the size of London and has about 3 1/2 million permanent residence. The streets are set up in a standard grid pattern with main thoroughfares running north to south and lots of side streets which host many bars, shops, restaurants and apartments. It’s very hard to truly get lost in the city. Awareness of just a few streets and landmarks will generally keep you on target. The most prominent landmark is Skycity. You can see it from most any point in the Aukland, and it is a hub of entertainment. More specifically, they have multiple restaurants bars and most importantly a casino. I did have dinner there one night and thought it was mediocre at best. The buffet contained your basic seafood and huff meats, but all items were bland. I would find out later, that this is pretty typical for New Zealand. The casino was very spacious and had most games that you would expect. Strangely absent was video poker and craps. However, I later discovered that there were a couple machines that had deuces wild incorporated into a host of other games. I also learned that Craps was going to be added soon. 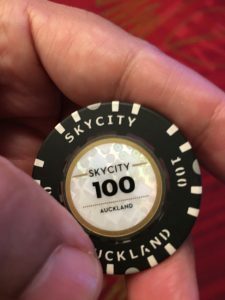 I was lucky enough to ask the right person about the casino (Floor Manager). He took me on a very brief tour of the property and showed me the half table craps game that had just been delivered. The majority of my time gambling was spent playing blackjack. The rules were similar to what I was used to, with a few exceptions. First of all, the dealer only dealt himself 1 card face up on the initial deal. Every other player was given the standard two cards. Any player that drew to 21 was paid immediately and if you drew five cards and did not bust, you were also paid immediately. Some of the down sides, were that you could not double on any soft hand and if the dealer hit 22 it was a push for anyone who had not yet been paid. The overall atmosphere of the casino was very festive. There were no free drinks, but an ample number of bars throughout the property at which you could purchase your beverage of choice. They also had decent wifi which was a plus for those trying to get information about surrounding entertainment options. I also think it is important to note that the place was immaculate. From the gaming floor to the bathrooms, this place was clean. I really enjoyed spending time in the casino and was fortunate. Venturing out of the casino, I was only a few blocks away from what would become one of my home bases. Ironically or not so ironically called “My Bar.” It were situated in a very dark alley near High street. Very good cocktails and they also had an asian restaurant next door that had decent noodles. The pricing on cocktails was average for the area but no bargain. The upshot was their very friendly smoking policy on the patio. They provided matches and ash trays, and they were also very close to one of the only cigar shops in town. Havana House had a very large selection of Cuban cigars, but as my friend Edwin says, you better bring your money. 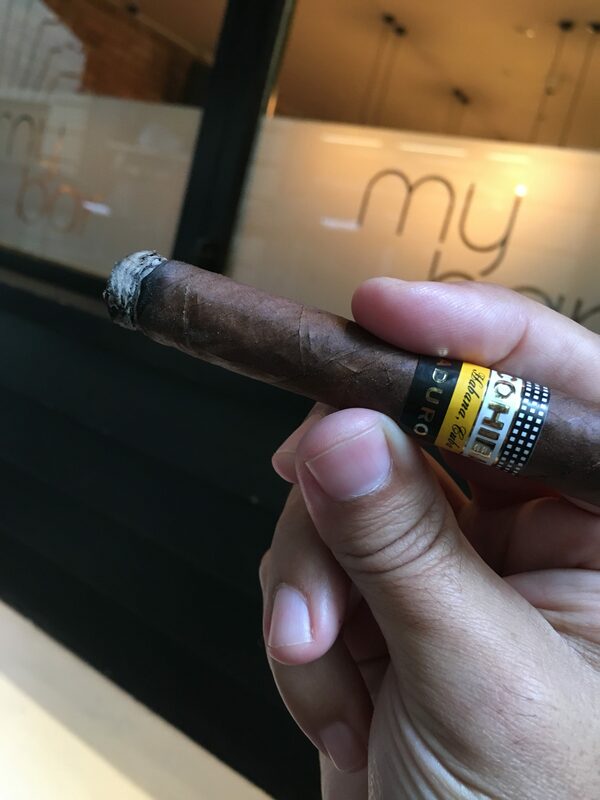 For about $50 US dollars you can get a 40 ring gauge 5 inch Cohiba. It was a tasty treat, but my only cigar on this trip. The next few days were pretty much rained out. 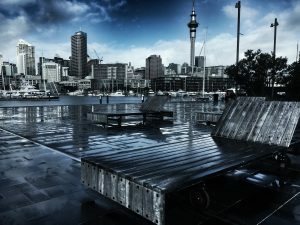 Again, traveling in June, puts you at the first bits of winter for New Zealand. It was actually a nice reprieve. I used this time to review my travel books and plan for the days to come. I very quickly noticed that the rain patterns were similar to the that of south pacific islands. More specifically, the rain swept in for about 30 or 45 minutes and then blue skies appeared. After a day of storms, I began to use the weather to my advantage. 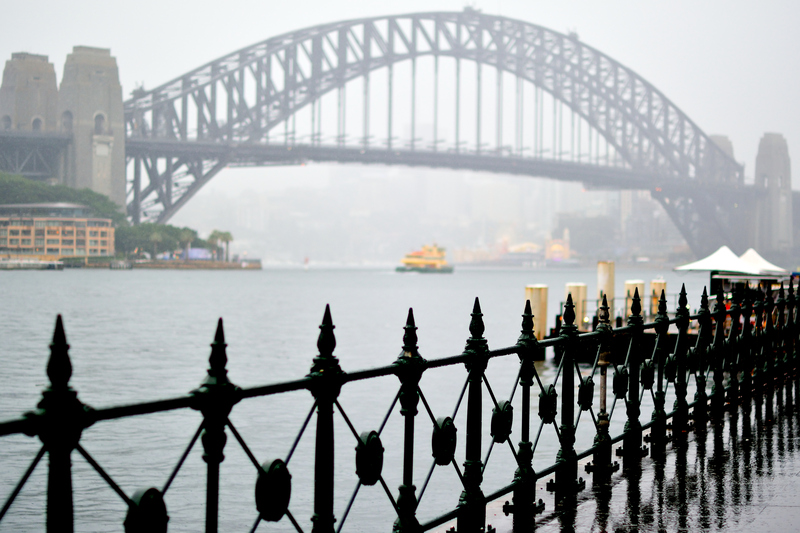 With an umbrella/parasol in hand, I pub crawled down to the wharf. 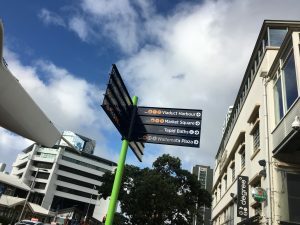 Auckland has multiple bars on every block. I walked as far as I could go during the breaks in rain, and I then popped into a pub when the deluge began. 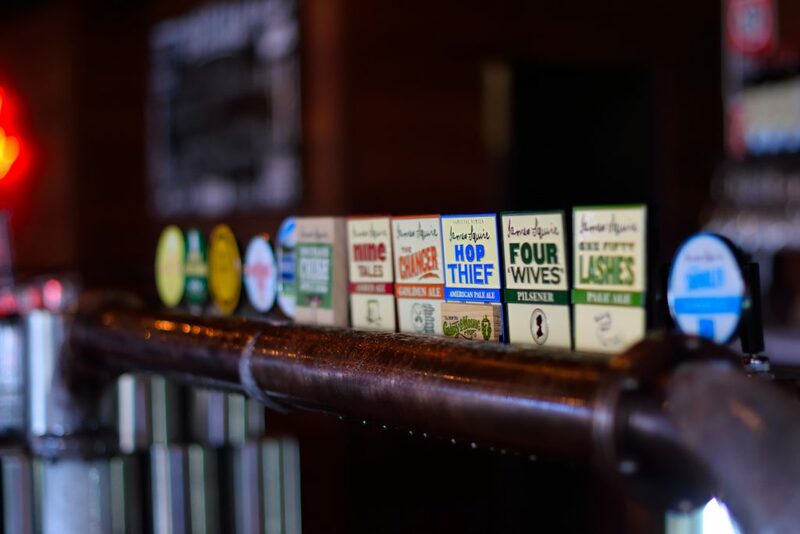 They are truly making very fine craft beers in New Zealand, and I sampled several dozen of them during my walkabouts. I didn’t have any bad beers on this trip. They pour a proper pint of ale, and I felt right at home in all of the dark and dingy pubs. A few of my favorite spots were My Bar, Father Teds, Wildfire and Gourmet Burger and Brew Kitchen. 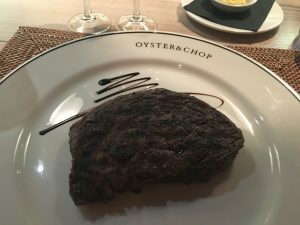 I can’t go any further in this blog without beginning to discuss the local cuisine. New Zealand has access to some of the most beautiful beef, lamb and seafood that I have ever seen. It is abundant and fresh. Unfortunately, they seem to have a very British palate (Sorry Alastair). Nearly every place I went served food that was exceptionally bland. It was all fresh, but lacked any seasoning. My three best meals were all from pubs, tapas bars or hole in the wall Asian places ( Danny Doolands, Mezze bar Spanish tapas, Yum Char Dim Sum). If I was to give a tip to U.S. travelers, stick to the Asian and Spanish food places. They seemed to be the spots that were most occupied by patrons and were generally less expensive than the main stream spots. As the weather broke, I planned a few additional excursions to neighboring islands and sightseeing cruises. One thing that you have to understand about me, is that I love being on the water, but I don’t necessary like being in water. 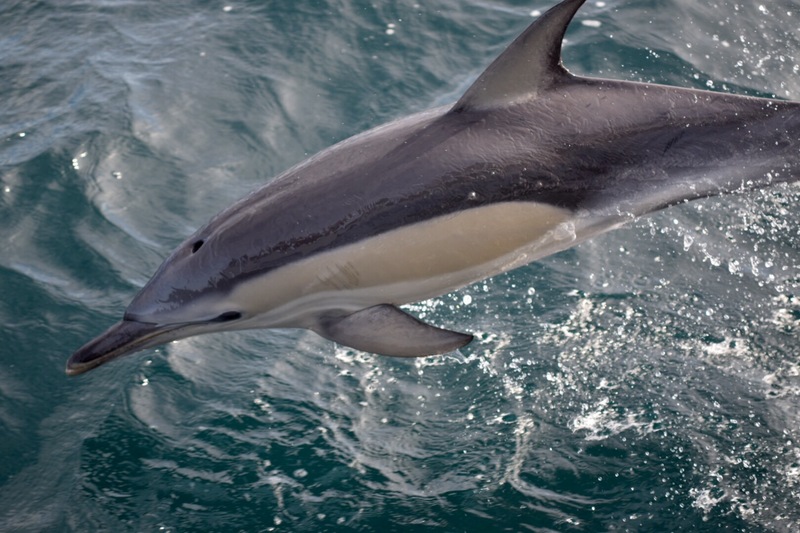 To address my weird needs, I got back on the Viator website and found a whale and dolphin watching tour. This half day tour absolutely knocked my socks off. 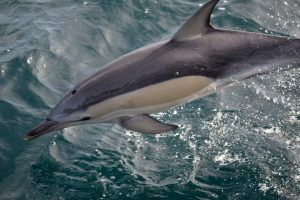 Within 40 minutes the boat was surrounded by a pod of 400 hundred dolphins. My camera was clicking off gigs of data within minutes. It was unbelievable! At that moment, we were truly engulfed in mammalian splendor. I have tried several times to describe this experience to people, but no matter what I say, it seems to pale in comparison to the actual moment. This tour was the most emotionally taxing of any I have ever been on. I experienced so much joy in those moments, that I was just absolutely spent on the boat ride home. 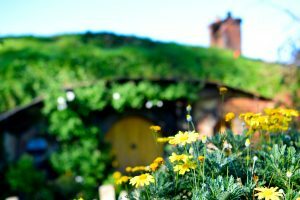 When you talk about traveling thousands of miles on a vacation, oftentimes people will try to attach cliche phrases like “Trip of a lifetime,” to the experience. I don’t know that I ever really agreed with the magnitude that those words implied. However, in this case I have to yield to the descriptor. This vacation evoked every emotional state that I can conjure. From the excitement of the journey, the dread of the 22 hour flight and the anxiety of literally being a world away from family and friends, this was truly a trip of lifetime. Episode 188 of Denton Dallas and Beyond, will include additional information on my New Zealand trip. Please subscribe to our podcast in iTunes and spread the word. Wonderful trip report. Sounds like a heavenly experience. Thanks buddy. Yes it was indeed a magical time. I hope you are well. While your blog was peppered (and the food was not!) with adjectives, this trip sounds truly indescribable. GREAT, GREAT review! Glad you’re back on American soil, bro! Much thanks. I am glad to be back on american soil and enjoying some well seasoned food. Cheers. Season’s Greetings! There’s no place like home!